According to a number of authors, the former US President Dwight Eisenhower allegedly signed in 1954, a secret agreement with an extraterrestrial civilization that had visited Earth. The entire story starts with President Harry Truman passing on the oval office to the reins of Dwight. D. Eisenhower in 1953. Along with the oval office, apparently, Truman gave Eisenhower a hefty file concerning top-secret, top classified files about a project called Majestic 12 that former president Harry Truman had established by Classified Executive order. Majestic 12 is the code name of an alleged secret committee of scientists, military leaders, and government officials, formed in 1947 by an executive order by U.S. President Harry S. Truman to facilitate recovery and investigation of alien spacecraft. 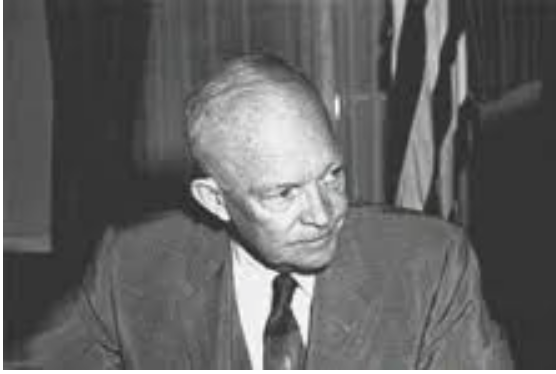 It is noteworthy to mention that among all presidents of the United States, it is perhaps President Eisenhower who was most passionate and interested about Unidentified Flying Objects and Alien Life. In fact, there is ample ‘evidence’ that suggests President Eisenhower met with alien beings at least three times. One such secret meeting is said to have taken place at Edwards Air Force Base (AFB) in California, and twice at the Holloman AFB in New Mexico. After the meetings in New Mexico, the number of UFO sightings allegedly doubled in the region. So, let’s take a look at the meeting that took place allegedly in 1954 at the Edwards Air Force Base. President Eisenhower firmly believed there was life elsewhere in the universe. The five-star Army general spent several days in Palm Springs on Vacation, in February of 1954. One Saturday afternoon, it was reported that the Former US President had disappeared for several hours, and even missed a public dinner that day. Eisenhower would not be seen until later the following morning. Obviously, the press inquired about the president’s whereabouts. The White House Press Secretary had told the press he had chipped a tooth while eating fried chicken, and that the president had visited a dentist. Washington Post Staff Writer, Peter Carlson, denies the story of the chipped tooth and calls it a cover-up. Curiously, despite the fact that the white house had sold the press the dentist trip story, there is no reference of a broken or chipped tooth, nor a dentist visit in Palm Springs at the Eisenhower Presidential Library, which features detailed reports of the former presidents medical and dental records. UFO hunters turn towards William Cooper as evidnece. He was on the Naval Intelligence briefing team and had total access to classified documents. According to his review of the classified files, alien civilizations were in contact with Earth. The first source suggesting that President Eisenhower had met with extraterrestrials can be traced back to Gerald Light, who, in a letter dated April 16 1954 to Meade Layne, the then director of Borderland Sciences Research Associates (now Foundation), claimed he was part of a delegation of community leaders to an alleged meeting with extraterrestrials at Edwards Air Force Base. The first meeting allegedly took place between Eisenhower and two Nordic appearing, blue-eyed ETs. Despite the fact that the alleged discussions were done in a polite manner, no agreement was reached. The Aliens supposedly wanted humans to stop nuclear testing, but we didn’t want to give it up. As no agreement was reached, both parties parted ways. However, the alleged aliens visited earth the following year to the Holloman AFB in New Mexico, not far away from the (in)famous Roswell alien aircraft crash site, for a subsequent meeting with Eisenhower. I have just returned from Muroc [Edwards Air Force Base]. The report is true — devastatingly true! I made the journey in company with Franklin Allen of the Hearst papers and Edwin Nourse of Brookings Institute (Truman’s erstwhile financial advisor) and Bishop MacIntyre of L.A. (confidential names for the present, please). When we were allowed to enter the restricted section (after about six hours in which we were checked on every possible item, event, incident and aspect of our personal and public lives), I had the distinct feeling that the world had come to an end with fantastic realism. For I have never seen so many human beings in a state of complete collapse and confusion, as they realized that their own world had indeed ended with such finality as to beggar description. The reality of the ‘other plane’ aeroforms is now and forever removed from the realms of speculation and made a rather painful part of the consciousness of every responsible scientific and political group. During my two days’ visit, I saw five separate and distinct types of aircraft being studied and handled by our Air Force officials — with the assistance and permission of the Etherians! I have no words to express my reactions. It has finally happened. It is now a matter of history. President Eisenhower, as you may already know, was spirited over to Muroc one night during his visit to Palm Springs recently. And it is my conviction that he will ignore the terrific conflict between the various ‘authorities’ and go directly to the people via radio and television – if the impasse continues much longer. The second alleged meeting is supposedly well documented. There are numerous eyewitness reports of the second meeting that had occurred between Eisenhower and ET’s at the Holloman Airforce Base in New Mexico, located some 120 miles from the infamous Roswell alien crash. It is reported that in February of 1955, hundreds of people witnessed Air Force One Land at the Holloman AFB. Eisenhower met with the aliens inside a saucer-shaped craft, where he remained for about 45 minutes. Curiously, the fabled Project Blue Book, the Air Force’s files on UFO sightings and investigations includes a 1950 incident at Holloman Air Force Base in Alamogordo, N.M., where an Air Force Office of Special Investigations agent reported seeing a star-like craft that amazingly shifted from a bright white color to red and green as it moved erratically in several directions. But the UFO Phenomena is a global phenomenon and a number of governments are aware of ‘their’ presence, argue UFO researchers. According to classified documents released by the Ministry of Defence in 2010, Winston Churchill may have ordered a UFO sighting to be kept a secret. The supposed UFO was seen flying over the East Coast of England by an RAF reconnaissance plane that was returning from a mission in France or Germany towards the end of the war. Churchill is said to have discussed how to deal with UFO sightings with Eisenhower. Is this story the result of an actual government-alien coverup? Most UFO researchers would agree that there may have been a time when UFO cover-ups were beneficial for the safety of our society. But, in modern times, things are different. Countless reports of UFO sightings and Alien visitations have been made public. In addition to that, a number of previously classified documents related to alien life have surfaced and are available to the general public. You can read more about the alleged Alien visitations and meetings here.